DENIS OMABA'S BLOGS: Obasanjo’s grandson (Babajide) turns rapper. 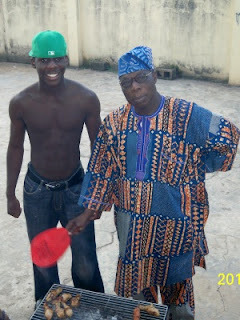 Obasanjo’s grandson (Babajide) turns rapper. Babsss. Real name – Babajide Obasanjo. The 18 year old just returned from London to study in a private university in Nigeria. Babsss is currently in the studio recording for a mixtape that is to drop in the middle of this year and I hear he is currently recording a remix of Davido’s Damiduro …and instead of omo baba olowo, it will be tagged ‘omo baba Obasanjo’. The remix drops on the 1st day of march 2012. So watch out for him.